Originally Kingswood Forest or "the King's Wood", Kingswood covers a large area between Bristol and Bitton. There were many coal mines in the Kingswood area, and the Kingswood miners were some of John Wesley's earliest congregations. See our links page for "Bristol Past", the website of the Fishponds LHS, which has further information on Kingswood Forest, and a large version of the Kingswood 1610 map. This page is under construction so please check back. Part of the Map of Kingswood, 1610, showing Windmill Hill and Barrs Court. 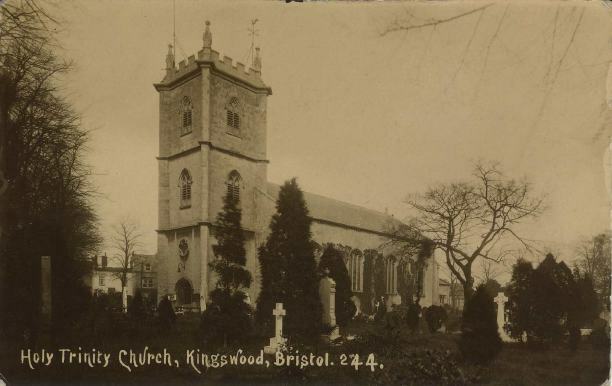 In 1821 Holy Trinity, Kingswood was the first church in the country built with a grant from Queen Anne's bounty. Part of its parish was carved out of the parish of Oldland and it covered the whole district of Kingswood, which included Hanham.